If you will be in the Middleton/Madison/Dane County area, come to the Middleton Wedding Tour on Wednesday, April 6, from 4 to 8 pm. The Mustard Museum and several neighboring businesses will help you plan your upcoming wedding. From lush flowers to stunning dresses, from honeymoon ideas to gift registries, downtown Middleton has put together an exciting wedding show for brides and grooms to be (and their families, too). It’s a free event but please request tickets online so we all know who will be coming. The final stop will be the Capital Brewery where you can win exciting door prizes (see complete event info below). Order your tickets via Eventbrite… just click below to register for the event! And, don’t forget the mustard! To bring personalized wedding mustards to your big day, contact the Curator at curator@mustardmuseum.com. 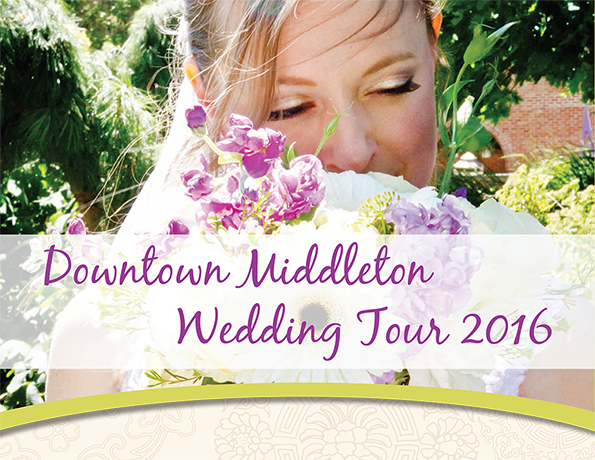 You are cordially invited to the 1st Downtown Middleton Wedding Tour 2016! Come and see what Downtown Middleton has to offer as you plan your upcoming wedding. Tour our lush flowers, beautiful dresses, gorgeous jewelry, tasty treats and desserts to tax planning, honeymoon clothing, hotels, gift registry and much more! Attendees can check in at one of the Take Off points to start your tour. At Take Off you will be given a Passport and a Map to each of the participating businesses. At each stop of the tour you’ll collect a stamp to fill your passport the more stamps you collect the more chances you have for door prizes at your final destination, The Capital Brewery! Stay late and enjoy beverages, socializing and more wedding networking at the Capital Brewery and stick around for the door prizes! Anyone planning or participating in an upcoming wedding or someone who just LOVES all things weddings. This is a free event to you and your guests but please register so we are prepared to accommodate everyone with taste sampling, prizes and other goodies.